Despite playing the child, Finnick always seems to be just as mature as, if not more than, Nick. While we don’t see much of him in the movie (and I hope we do if/when we get a sequel), Finnick in the fandom is a jerk with a heart of gold. He may be loud and angry, but deep down, he really does care for Nick, and has his back when things go wrong. 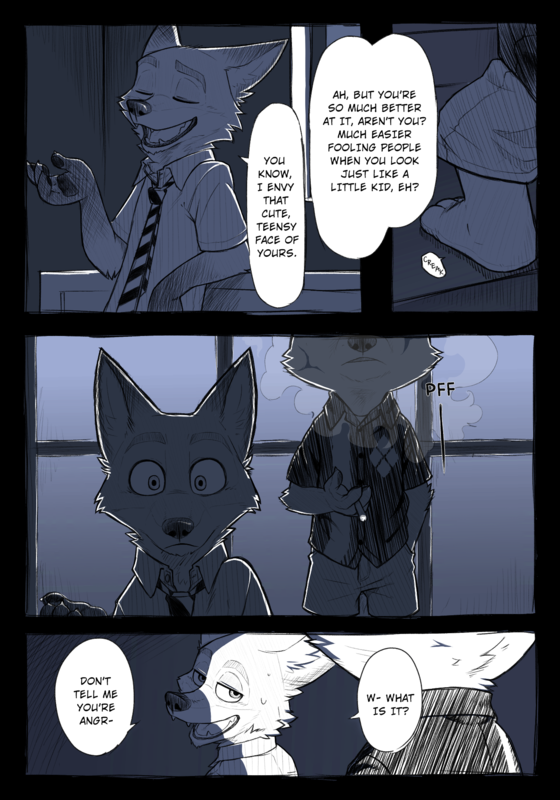 Thanks to Flapjack for making the original comic and for providing textless versions of the pages, and to LMAbacus for translating and editing it! 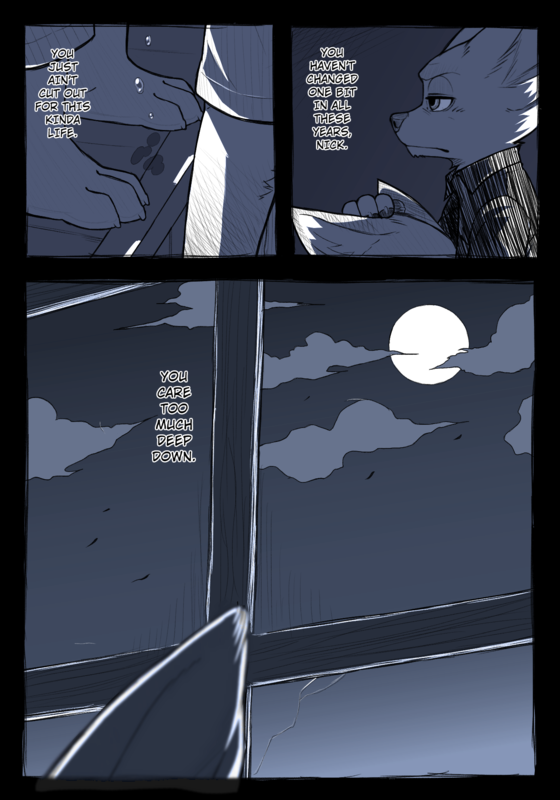 Check out the original over on Twitter, and the translated version after the break! As usual for translated comics, read from right to left! 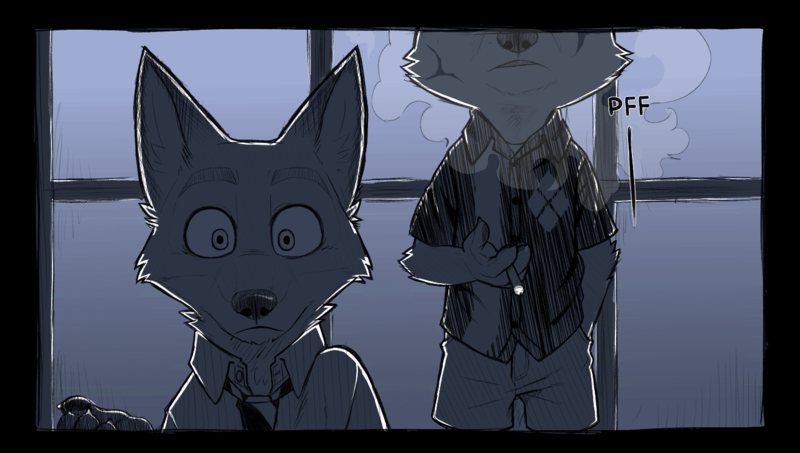 Sometimes, Nick had a habit of hide his emotions about certain events. 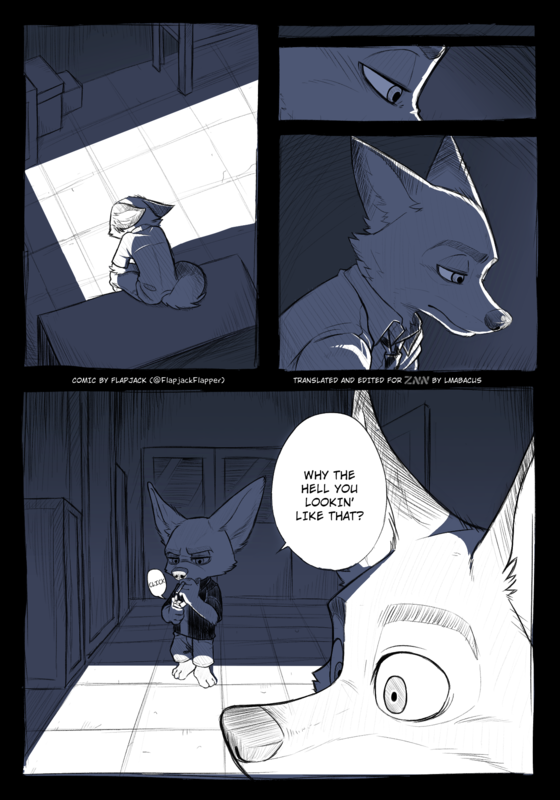 After all this is why he "never let'em see what they got to him"
While the context isn't exactly clear, I think the majority of the comic takes place after the Press Conference, with the last panel being Finnick recounting the tale to Judy in front of an embarrased Nick. It makes the most sense to me, anyway. I actually asked the artist about this, to decide what to put in the description, and he replied, "I'll leave that to your imagination". So it could be from that, or it could be some other event. That was the impression I got. But if that's the case, Judy is being rather flippant about it in the last page. 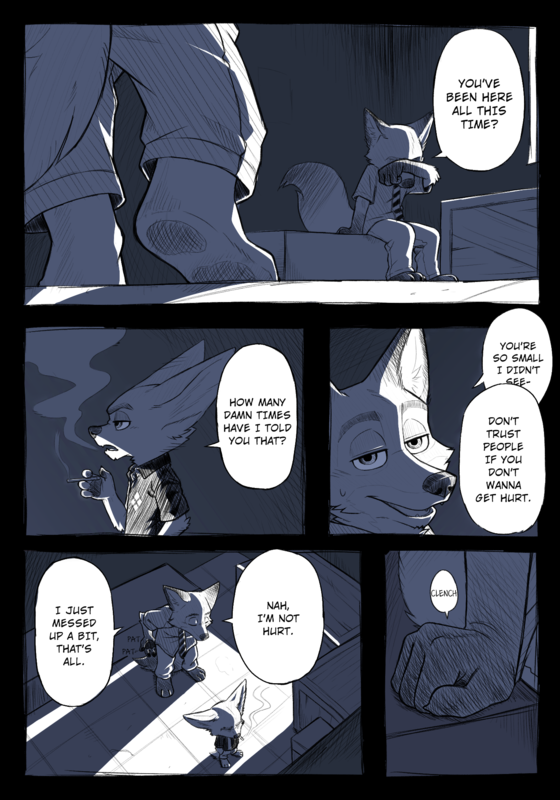 I would think she'd feel bad for causing Nick's sorrow in the first place rather than teasing him about it. 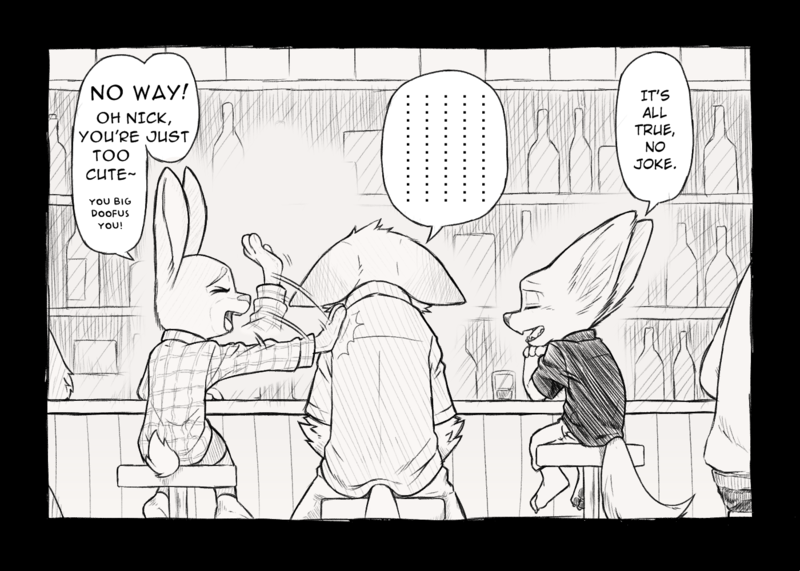 Judy: "Nick, I'm really, Really, REALLY sorry for hurting you back there. I really was–"
Nick: "Shush, Carrots. We've made up, right? I already forgave you, no need to apologize again. It's all water under the bridge now…"
Finnick: "Hey, Judy, wanna hear a funny story?" And Finnick smartly embellished and reduced what actually happened, so even though he was not lying, but the gravity of the situation at the time was not spoken. Okay, I got emotional whiplash. Crying when Nick cried on Finnick's chest, then suddenly bursting out with laughter at the last panel.